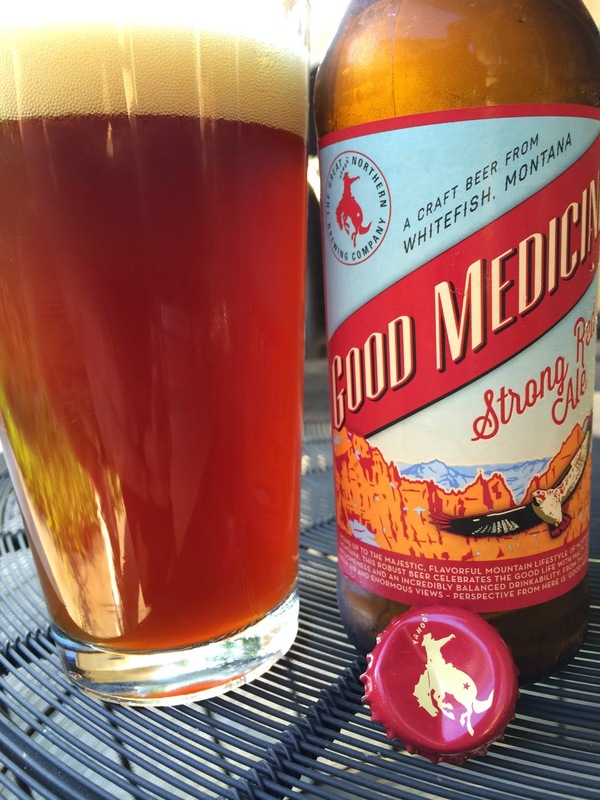 The biggest of the four Great Northern beers I got to try recently was Good Medicine Strong Red Ale, clocking in at 7.5% alcohol, 55 IBU. Good Medicine is named after the perspective you get from living the good life in the land of fresh air and enormous views! Sounds good to me. The label shows a hawk soaring high in the mountains around it. Rich caramel aroma. Flavors follow with loads of sweet caramel. A little spiciness was there. Same with a hint of citrus. I really wanted more of both of those to counter the sweetness. An alcohol streak through the finish was a welcome change, though. And I thought Good Medicine seemed on the flat side. Anyway, not bad though I definitely preferred their IPA and wheat beers from the year round lineup.